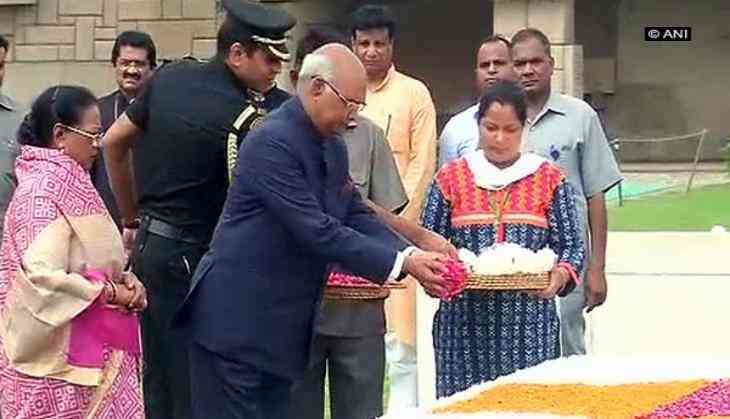 Ahead of the swearing-in ceremony, President-elect Ram Nath Kovind along with his wife Savita Kovind paid tribute to the Father of the Nation Mahatma Gandhi at Rajghat on Tuesday. Kovind will be sworn-in as the 14th President of India by the Chief Justice J.S. Khehar at the Rashtrapati Bhawan. Following which, outgoing President Pranab Mukherjee and Kovind will have a one-on-one discussion on important files and policies before leaving for the Central hall. At the Parliament, both will be received by Vice-President Hamid Ansari, Prime Minister Narendra Modi and Speaker Sumitra Mahajan. The stage will be shared by President and President-elect, Speaker, Vice President and Chief Justice of India. After the oath of new President a 21-gun salute will be honored followed by the acceptance speech of President elect Kovind. After the event the new president and Mukherjee will proceed towards Rashtrapati Bhavan where outgoing President will give Kovind a tour of the official residence. Following which, the new president will proceed towards his new residence - 10, Rajaji Marg. Kovind, a National Democratic Alliance (NDA) nominee last Thursday won the presidential elections by defeating Opposition candidate Meira Kumar. After final round of counting, Kovind got 7,02,044 votes out of a total of 10,69,358 while his opponent and former Lok Sabha speaker Kumar secured 3,67,314 votes. A lawyer by profession, Kovind has worked extensively in Uttar Pradesh and Bihar. Kovind has been the Bharatiya Janata Party (BJP) Scheduled Caste Morcha chief (1998-2002) and the President of the All-India Koli Samaj. He also served as the national spokesperson of the party. The saffron party had even tired to project him as an alternative to Mayawati in Uttar Pradesh. He was enrolled as an advocate in 1971 with the Bar Council of Delhi. He became the Advocate-on-Record of the Supreme Court in 1978 and practised in Delhi High Court and Supreme Court for about 16 years till 1993. He was appointed as the Governor of Bihar on August 8, 2015. He was elected to the Rajya Sabha from Uttar Pradesh during the two terms of 1994-2000 and 2000-2006. Kovind served as member of the board of management of the BR Ambedkar University, Lucknow. He also served as member of board of governors of Indian Institute of Management, Kolkata. Kovind also represented India in United Nations (New York) and addressed the UN General Assembly in October, 2002.